Founded as White Hall in 1835, the area the area now known as West End was an important crossroads. In the late 1840s, the Macon and Western Railroad line (later Central of Georgia Railroad and now a “paper railroad” within the Norfolk Southern Railway group) was established to provide easy access to downtown Atlanta and quickly increased the economic viability of the White Hall area. Shortly thereafter, real estate speculators, including George Washington Adair, John Thrasher and Thomas Alexander, bought lots along the railway, anticipating future growth. In 1868, the residents of the area received a charter and renamed the community West End, after London’s trendy theater district. In 1870, George Washington Adair and Richard Peters joined forces to form the Atlanta Street Railway Company as a way of providing easy access from Atlanta to the West End suburb. 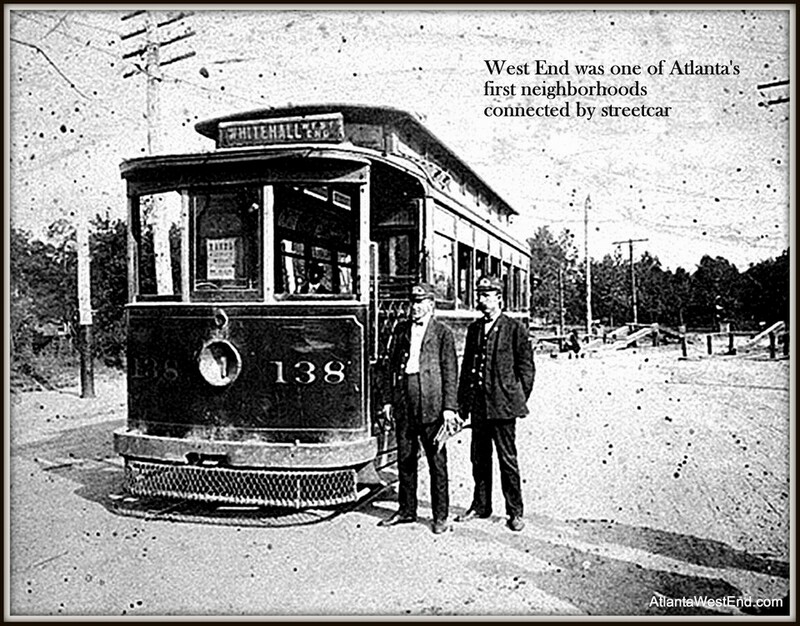 Known as one of the original streetcar suburbs, West End had trains that ran along the major corridors, including Gordon Street (now Ralph David Abernathy Boulevard), Porter Place (now Lucile Avenue) and Ashby Street (now Lowery Boulevard). West End quickly became a much sought after suburban community and the area grew rapidly in population and prosperity throughout the late 1800s and early 1900s. During that time, many of the West End homes you see today were built. The predominant historic house types found throughout the neighborhood include Craftsman bungalows, Queen Anne and Folk Victorian. Originally a neighborhood that catered to the white upper class, West End played home to several notable residents, including E.P. Howell, former Mayor of Atlanta and owner of the Atlanta Constitution newspaper, as well as numerous authors such as Frank L. Stanton, Made Bigham and Joel Chandler Harris. 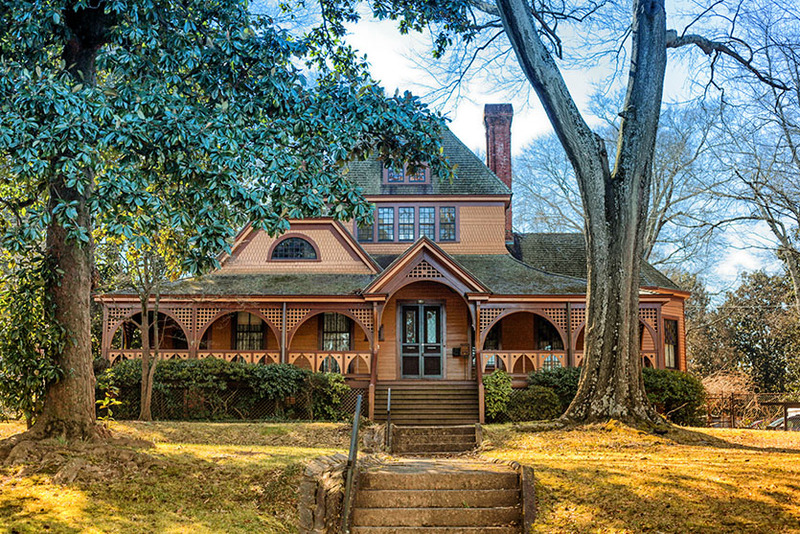 Known for his Uncle Remus tales, Joel Chandler Harris’ Queen Anne style home, the Wren’s Nest, is now a museum and open to the public for tours, storytelling and other cultural events. By 1930, West End was a thriving community that featured a vibrant business district at Gordon (now Ralph David Abernathy) and Lee Streets, including branches of Sears, Goodyear and Piggly Wiggly, and more than 22,000 residents. The 1940s were still a prosperous time for West End, but the community was aging, and by the mid-1950s, the younger generation began to migrate to the suburbs. During the late 1950s and early 1960s, the demographic of the West End began to change, as African-American families moved in. In 1961 the state of Georgia allowed for 9 African American students to attend 4 previously segregated schools, one of which was Brown High School (now Brown Middle School). Brown High School welcomed two African-American students in 1961 and a third African-American student in 1962. In 1963, Brown High School graduated three African American students, and was among the first high schools in the state to do so. Following the Civil Rights Movement and subsequent passage of major civil rights legislation, the racial makeup of West End community began to rapidly change. “White Flight” was taking place across the country, and things were no different in West End. By the late 1960s, West End had become a primarily African-American community, as most white families had relocated to Atlanta’s northern suburbs. Toward the end of the Civil Rights Movement, Dr. Ralph David Abernathy led the efforts for West Hunter Street Baptist Church (with an almost exclusively black congregation) to purchase Gordon Street Baptist Church (a formerly white church), before taking the helm of the Southern Leadership Conference following the unexpected death of Dr. Martin Luther King, Jr.
Around this time, St. Anthony’s Catholic Church saw a similar demographic shift and the Shrine of the Black Madonna acquired the Gordon Street Theater, bringing religious diversity to this burgeoning African-American community. By 1980, West End residents were almost exclusively African-American and very firmly rooted in the American middle class. 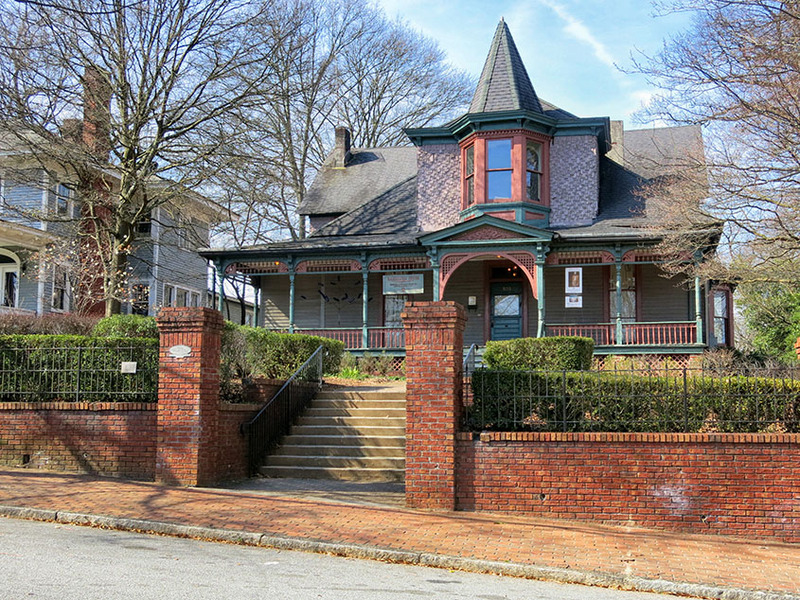 Black professionals, including Dr. Otis Hammond (who purchased the home now known as the Hammonds House Museum), as well as students and faculty from the Atlanta University Center began to purchase homes in West End and a sort of renaissance began. West End quickly transformed into a hub for African-American culture. Hammonds House Museum opened in 1985, meanwhile Pearl Cleage was writing novels about West End and the Malcolm X Festival became a citywide event in West End Park in 1989. Unfortunately, in the late 1990s and early 2000s, West End was at the epicenter of the mortgage fraud crisis that triggered the worst recession in a generation, causing many homeowners to suffer and a significant number of homes to go into foreclosure. In 2008, at the bottom of the economic downturn, the first segment of the Atlanta BeltLine West End trail opened and real estate opportunities began to abound. Slowly, but surely, formerly vacant or foreclosed homes were given a new lease on life. In 2014, the Atlanta BeltLine was awarded a TIGER V grant by the U.S. Department of Transportation, which finalized funding for a 3 mile stretch of the Westside Trail that runs through the West End corridor and is scheduled to open to the public in 2017. Since the announcement of the BeltLine expansion into Southwest Atlanta, West End has seen lots of increased attention from young professionals, families, retirees and many others from all walks of life seeking to make West End their home.